A few months ago I googled the word ZOZO. To my shock, many other people have also been contacted by a demon by the SAME NAME! I read about 20 similar stories and I am now convinced that this simply CANNOT be mere coincidence. Supposedly ZOZO is an ancient demon name which possibly stands for "The Destroyer." Claims of demonic possession are associated with this ZOZO, and I feel it my duty to warn people to steer clear from this if it happens to present itself during a Ouija board session. I am currently researching this phenomena for a future book, and am in the initial stages of presenting my findings to a reputable demonologist who has been involved in hundreds of cases of paranormal activities across the world including "A Haunting in Connecticut." What is the Devil's Bible known as? The following was sent in by Darren concerning his Quija experiences. It's too long for one post. Therefore, it had to be broken up in to several. Thank you, Darren, for sharing your story. My name is Darren and I am from Tulsa Oklahoma. I am currently 40 years old, and have held a fascination with the occult since an early age. 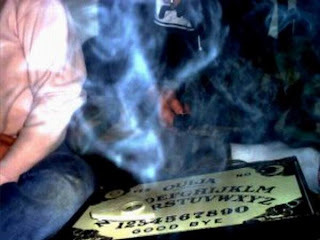 I have had many bizarre experiences with Ouija boards and I am writing this as a warning to people that bad things can happen because of these "portals." I'm sure the majority of you has seen the trailer for the new horror flick A Haunting in Connecticut. This movie is based on the experiences of the Snedeker family who lived in a former funeral parlor in 1980s. Their story was also featured on an episode of "A Haunting" on the Discovery channel. The current residents and their surrounding neighbors are being plagued by the film's fans who are taking time out of their busy schedules to view the famous house. When the Snedeker family resided in the home, their son claimed to have heard noises in his basement bedroom which use to display caskets next to the embalming room. He also claimed to have seen shadows on the walls which belonged to no physical person. Their niece, while visiting, stated she felt hands on her body as she slept and the covers levitated off of her. While Carmen Snedeker was mopping one day, the water turned blood red with a fowl odor to boot. Crucifixes throughout the house disappeared. There seems to be a common theme this week. I was asked about the status of Snowball Mansion Bed and Breakfast. It seems this place may be closed down. Whether it be permanent or temporary, I don't know. I logged in on Myspace the other day to learn that the Seven Sisters Inn is in danger of foreclosure. That's right foreclosure. As in going to auction on April 7th unless someone buys it before then. The current owners Ken Oden and Bonnie Morehardt have been trying to sale the inn for years. They had a buyer but the deal fell through. No matter what happens I hope the Seven Sisters Inn is put in good hands. Kelly Road connects Industry and Ohioville, Pennsylvania. It may look like an average road but many know it by its more sinister name, Mystery Mile. It is said that animals go from docile to aggressive to the point of chasing people on this two-mile stretch. Others claim to hear unexplained noises, tempers are raise and some see white apparitions. But what could be responsible for these disturbances? The exact explanation is unknown. Some believe it's tied to cult activity. However, the popular theory is the supernatural occurrences is possibly linked to a curse placed on Mystery Mile by Native Americans, angry from the "White Man" taking their homes. Whatever the cause, after reaching the one-mile marker, the disturbances cease. Mystery Mile provided inspiration for the film The Way of the Seeming. Check out their website for more information on this legend. What do you think about hoax contests? Longfellow's Wayside Inn was built in 1716 and is considered the oldest in the country. The Inn was an expansion of David Howe's home known as Howe's Tavern. Four generation of Howes operated and expanded as business thrived until 1861. Relatives who inherited the establish stopped overnight accommodations but rented it out for dances and lengthy visits. Henry Longfellow never owned Wayside Inn but it was renamed after him in 1892. Longfellow wrote a series of poems based on fictional characters who gathered regularly at the Inn. Published in 1863, The Tales of Wayside Inn launched it to national fame. Edward Rivers Lemon purchased the Inn in 1892, renamed it and operated it as “a retreat for literary pilgrims.” In 1923, Henry Ford, the last private owner, purchased and expanded it to 3,000 acres. He added several buildings including The Martha-Mary Chapel, Grist Mill, and Redstone School. This is Ghost Stories 100th Question of the Week! Yay! I think I've found the perfect one to ask on such an occasion. I was reading a post over on Sue's blog about a common argument among the paranormal community. It has to do with ghosts and clothing. I've never really thought about it, personally, but it brings up a good point. When a person describes an apparition, clothes are usually apart of that description, but why? Why are ghosts always seen clothed and not naked? They are back! Ghost Hunters International wrapped up their season this week with an eventful investigation at Karosta Prison in Latvia. Now, the originals are coming back in to TV action this Wednesday, March 11. Their first investigation for season 5 takes place in.....the Betsy Ross House in Philadelphia, PA. The Betsy Ross house was built in 1740. Betsy and her husband John never actually owned the house. They rented it to also be the site of their upholstery business between 1773-1786. During this time, she supposedly sewed the first American flag (this is a rumor not a fact. Learn more here) even though she did sell flags as a part of her business. In 1786, Betsy moved in with married daughter. Up until 1898, the property switched hands and was the site for several businesses. Then, the Betsy Ross Memorial Association acquired it. From the title, I'm sure you're scratching your head asking yourself "What could be so strange about a couple of white dogs". They haven't been classified as dogs per se. Eye witness accounts describes these creatures as "large, white, and dog-like". In 2008, a man spotted this creatures about 800 feet away. At that distance, some may question his ability to describe them accurately. How did he know they looked like dogs? Or, that they appeared to be in the 200 lb category? According to the eye witness, they were large enough for him to fear the safety of his cattle. He grabbed his rifle and wounded one of the "white dogs". The dog turned red but didn't react like a wounded animal and no blood was found in that area. A couple of days later, his daughter saw the dogs on her property but said there was no blood or evidence it had ever been shot. Built in 1869, architect Lucas Pfeiffenberger crafted a home with sixteen rooms, a vaulted wine cellar, eleven marble fireplaces and beautifully carved banisters in Alton, Illinois. McPike Mansion was home to Henry Guest McPike and his family. A famed horticulturist, he perfect the McPike Grape and became well known across the country. It is believed the McPike family lived in the mansion up until 1936. Although there may be some discrepancies with the dates. Records state Paul a. Laichinger owned and lived in the house between 1908-1930. Either way, it has been unoccupied since 1950s. The current owners Sharyn and George Luedke bought it at an auction in 1994. They are in the process of restoring it to its former beauty. Leah from Daily Piglet has bestowed upon me the Superior Scribbler Award! For some reason, she thinks I'm one of the special people who deserve to have it. Of course, now that I have it, I'm giving it back to ya, Leah. Though I am suppose to hand it off to some other people I feel are superior scribblers. With this award, there are rules attached. Sometimes they feel more like memes than actually blogging awards but anyways. Let's get pass the formalities.